The GSX-R1000 is a motorcycle that has been fine-tuned and developed on racetracks and on asphalt around the world. It's a machine that resolutely defines dominance, having won an incredible seven straight AMA Superbike Championships in a row. 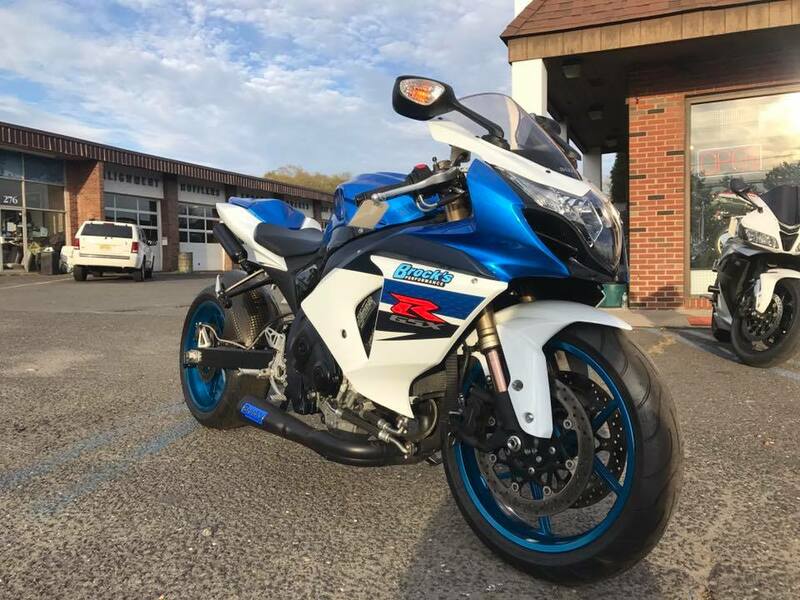 With its class-leading engine, chassis and suspension technology, there's no question that the GSX-R1000 is the undisputed superbike of our era. 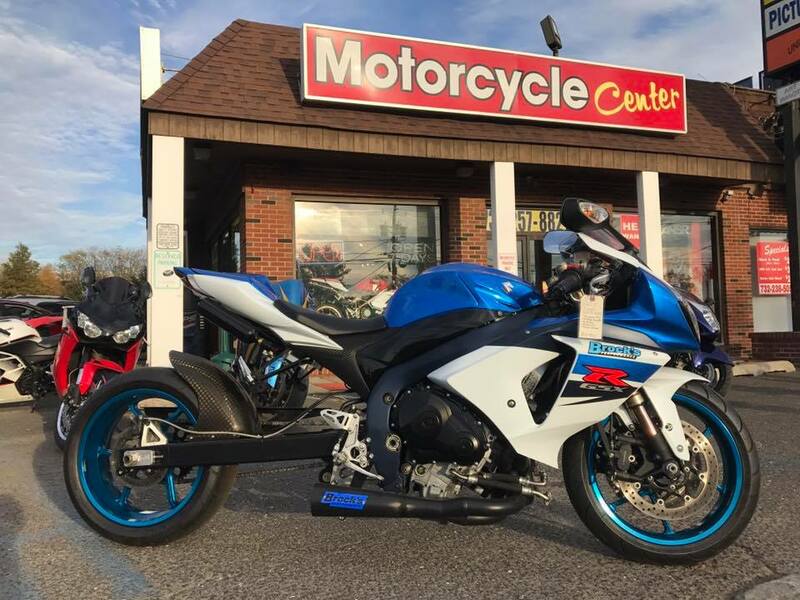 New for 2011: The GSX-R1000 is offered in a new Metallic Triton Blue/Glass Spash White finish with updated graphics as well as a Solid Black/Metallic Mat Titanium Silver. The class-leading GSX-R is powered by a 999cc four-cylinder powerplant with a bore and stroke of 74.5mm x 57.3mm and a compression ratio of 12.8:1. This engine delivers enhanced throttle response across the entire RPM range and offers high potential for racetrack performance. The engine is built with high-quality titanium valves, forged pistons and shot-peened conrods. The combustion chamber accommodates large intake and exhaust valves. Intake valve size is 31mm and exhaust valve size is 25mm. The engine's oversquare bore and stroke of 74.5mm x 57.3mm gives it specifically increased performance at high RPM. The compact engine allowed Suzuki engineers to incorporate a shorter wheelbase design with a longer swingarm for improved racetrack performance. Suzuki Composite Electrochemical Material (SCEM)-plated cylinders integrated into the upper crankcase helps reduce friction, improve heat transfer, increase durability and provides better ring seal. The SDTV (Suzuki Dual Throttle Valve) system uses two butterfly valves in each throttle body barrel, the primary valve controlled by the rider via the twist grip and the secondary valve controlled by the ECM. Each throttle body feeds two cylinders and each throttle body barrel carries two ultra-fine-atomization, 12 hole injectors that produce a fine fuel mist for more complete combustion. This ultimately reduces fuel consumption and exhaust emissions. 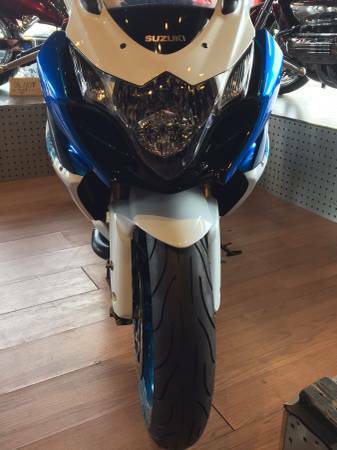 In addition, the GSX-R1000 is outfitted with Iridium spark plugs, which produce a strong spark for efficient combustion. A unique Suzuki Drive Mode Selector (S-DMS) system allow the rider to select one of three fuel injection and ignition system maps, adjusting power delivery to suit personal preference. Using a button on the left handlebar control module, the rider can instantaneously switch between the three available maps, which are designated A, B and C as displayed on the instrument panel. A large, efficient radiator with a trapezoidal shape developed on factory team racebikes and a trapezoidal engine oil cooler both help reduce drag. The oil cooler's trapezoidal shape (instead of the more conventional rectangular shape), allows the lower fairing to be narrower, which helps improve aerodynamics and reduce drag. Suzuki Advanced Exhaust System (SAES) uses an under-engine chamber with low-slung, large-volume race-inspired titanium mufflers. The back torque-limiting clutch incorporates the Suzuki Clutch Assist System (SCAS) for light clutch pull and optimum clutch performance. This cable-operated back-torque-limiting clutch makes for efficient clutch operation with superb feel. The GSX-R1000 is equipped with a compact twin-spar cradle frame made of five cast sections. The frame is paired with a one-piece die-cast rear subframe and an arched swingarm made of three castings. Lightweight Showa Big Piston front Forks (BPF) 43mm fork design eliminates the internal cartridge assembly inserted into each fork leg and instead uses a single 39.6mm upper piston riding against the inside wall of the inner fork tube. This endurance-race-proven design offers more effective valving, with more controlled compression to deliver better feedback to the rider. The front brakes feature fully floating 310mm discs and rigid, lightweight race-proven monoblock forged radial-mount calipers. The rear disc brake works with a single piston caliper mounted above the swingarm. The edgy and clean GSX-R1000 styling incorporates fairing and bodywork details aimed at reducing turbulence and drag. Attention to rider comfort includes a carefully shaped seat and adjustable footpegs (the footpegs remain three-way adjustable - 14mm in a horizontal and vertical range). A tailsection cover is also included for solo rides or track days. The capacity of sculpted fuel tank is 17.5 liters (4.6 US gal). Only the Californian spec. model has a 16.5 liters (4.4 US gal) fuel tank. 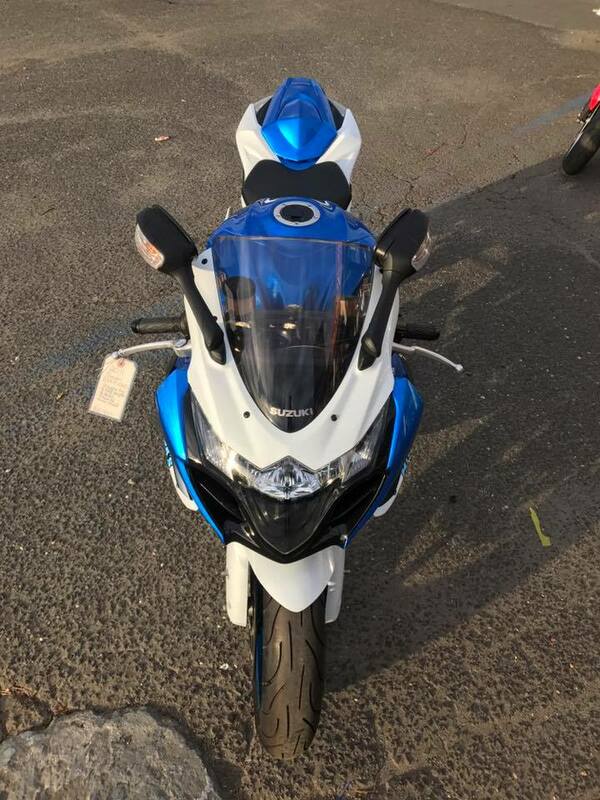 The GSX-R1000 has distinctive multi-reflector headlight with vertically stacked high and low-beam halogen bulbs centered between position lights on each side. The front and rear turn signals feature clear lenses over amber bulbs.